The company is preparing to raise debt in part to pay for the acquisition of a majority stake in domestic petrochemical group Sabic, worth about $69 billion. The deal is a Plan B to generate money for Saudi Arabia’s economic agenda after an IPO of Aramco was postponed. In effect, Crown Prince Mohammed bin Salman is using the firm’s pristine balance sheet to finance his ambitions. Aramco will pay 50 percent of the Sabic acquisition cost when the deal closes and the rest over the subsequent two years, according to a person who saw a presentation made to potential investors on Monday. Aramco declined to comment. The 470-page bond prospectus, filed with the London Stock Exchange, detailed a litany of risks for prospective investors, including missiles falling on Aramco’s installations, the impact of proposed U.S. antitrust laws on OPEC, the fight against climate change, and even the risk that Saudi Arabia will break the peg between its currency, the riyal, and the U.S dollar. It also revealed the Saudi oil giant was the victim of a "successful" cyber attack in 2012 that forced the company to move some operations into "manual" mode. While the prospectus revealed the richest company on the planet, it also showed how reliant Aramco is on high oil and natural gas prices. In 2016, when the price of Brent crude plunged to average $45 a barrel and OPEC cut production, the company struggled to break even. Net income for the full year was just $13 billion and free cash flow a tiny $2 billion. The kingdom’s dependence on the company to finance social and military spending, as well as the lavish lifestyles of hundreds of princes, places a heavy burden on Aramco’scash flow. Aramco pays 50 percent of its profit on income tax, plus a sliding royalty scale that starts at 20 percent of the company’s revenue and rises to as much as 50 percent with the price of oil. 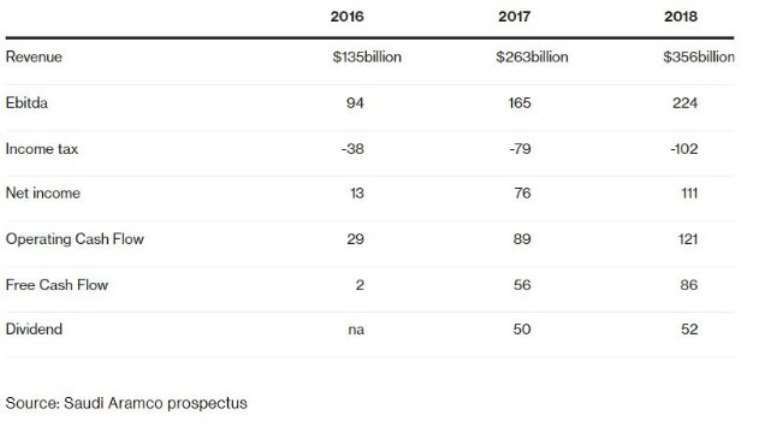 Aramco reported cash flow from operations of $121 billion and $35.1 billion in capital spending, and paid $58.2 billion in dividends to the Saudi government in 2018, according to Moody’s. In a presentation to potential bondholders, the company said its "ordinary dividend" last year was $52 billion. There wasn’t an immediate explanation about the gap between the two figures. Fitch said its A+ rating reflects the “strong links” between the company and the kingdom, and the influence the state has on Aramco through regulating the level of production, taxation and dividends. 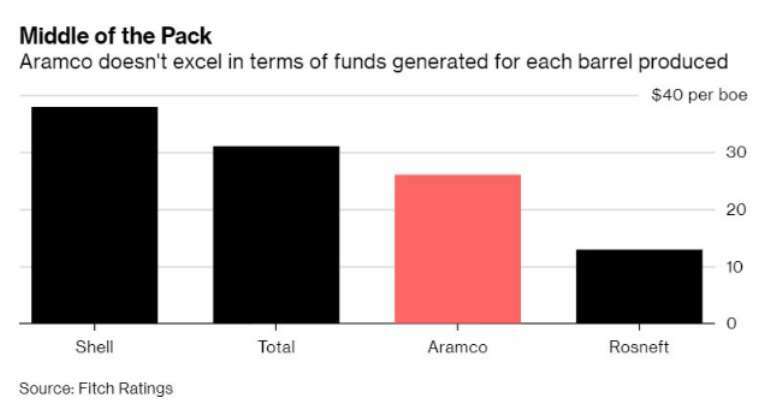 Aramco reported funds flow from operations -- a measure closely watched by investors and similar to cash flow from operations -- of $26 abarrel equivalent of oil last year, according to Fitch. That’s below what Big Oil companies such as Shell and Total SA enjoy, at $38 and $31 per barrel, respectively. 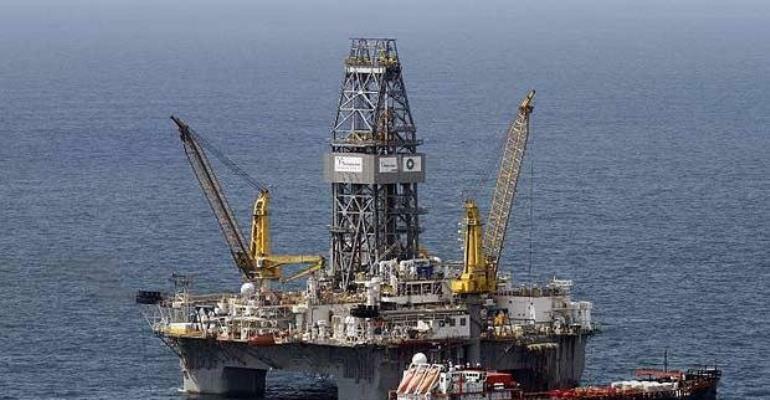 “Funds from operations, which is operation cash flows before working capital changes, is the best measure to compare oil companies’ profitability, since Ebitda does not take into account taxation,” Dmitry Marinchenko, senior director at Fitch in London, said in an interview. Aramco told potential bondholders it generated operating cash flow of $121 billion in 2018. Although that’s significantly higher than oil majors produce, the difference isn’t a large as the Ebitda or the net income. Shell, for example, reported cash flow of $53 billion, despite a significantly lower oil and gas production than Aramco. Exxon reported cash flow last year of $36 billion. Fitch’s A+ rating for Aramco is one level below the AA- for both Shell and Total. The Moody’s rating is well behind Exxon’s top Aaa level. The company will hold meetings with investors in coming days in cities including London, New York, Boston, Singapore, Hong Kong, Tokyo, Los Angeles and Chicago. Aramco picked banks including JPMorgan Chase & Co. and Morgan Stanley to manage the debt offering. The bond plan, credit rating and the publication of the first extracts of Aramco’s accounts are all part of the ambitions of Prince Mohammed, who controls most of the levers of power in the kingdom and wants to pursue an IPO as part of his plans to ready the country for the post-oil age. Yet his ambition to secure a $2 trillion valuation has faced pushback from global investors, prompting a delay in the IPO. For all the shock and awe in Aramco’s big reveal, the published numbers appear to leave that valuation a long way off , implying a dividend yield about half of what Shell pays.